You know that someone with two sets of names, both first and last, was bound to be an interesting person and the man we spelled as “Alain Meuse” was more than just interesting — there was no one quite like him. 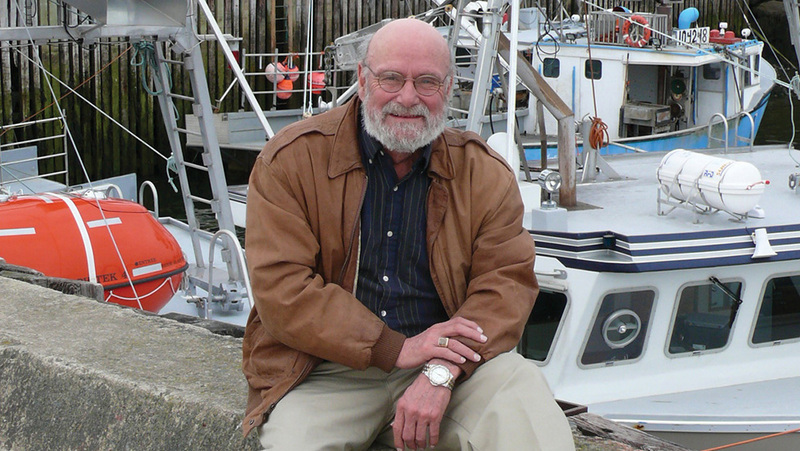 Allen Muise, as he was officially named, passed away on August 5, 2017 and his loss leaves a huge gap in fisheries journalism in southwest Nova Scotia. For us at the Navigator his passing means the loss of a colleague. For me personally it means the loss of a friend of 35 years. Alain was born in the small French Acadian community of Amirault’s Hill near Wedgeport, but made Yarmouth his home for over 50 years. Friends say he was a trailblazer of sorts. Most young French Acadian men in his area of Nova Scotia stayed close to their roots in adult life, making a living through fishing, farming and other resource industries, but Alain wanted something different. After graduating from high school, he set off to Toronto to study journalism at Ryerson University. 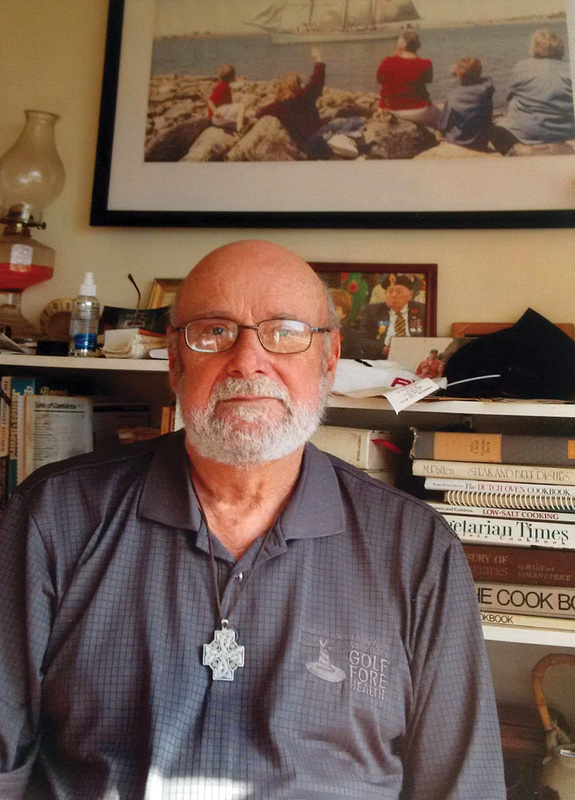 Not one for the big city lifestyle, Alain was back in southwest Nova Scotia immediately after graduation to begin what turned out to be a stellar journalism career that lasted more than five decades. He wrote for several publications, most notably he was editor of The Sou’Wester, a fisheries newspaper based in Yarmouth. Ten years ago, he became a contributing writer for The Navigator magazine. His last article was written while he was in the palliative care unit at Yarmouth hospital just days before his passing. It was published in the September issue. Alain is remembered for many things. Besides being a great writer with his own distinctive (some would say “quirky”) style, he was a great cook. He was especially known for making a mean ‘rappie’ pie, a traditional southwestern Nova Scotia Acadian dish made primarily with grated potatoes and chicken. His daughter Barb Muise says when her dad went on sport fishing trips with buddies, he would always appoint himself chef for the outing. 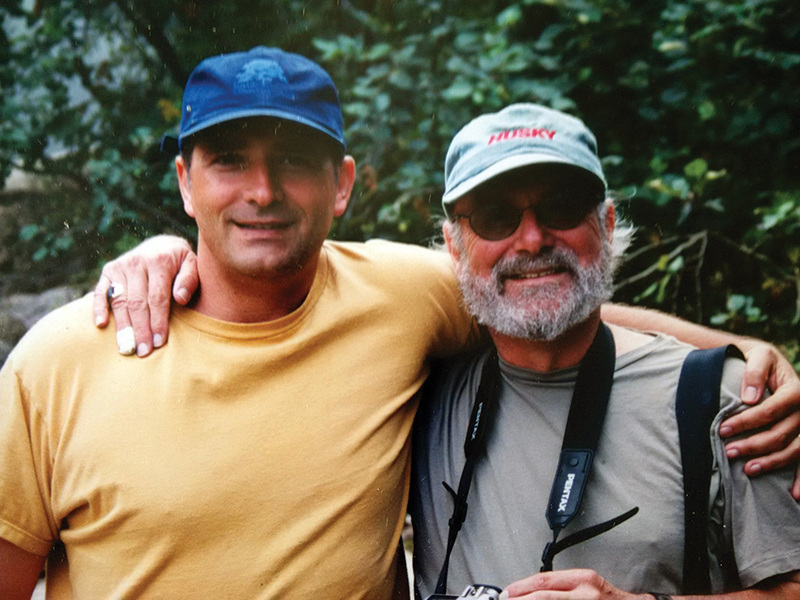 Alain was an avid reader and a collector of books that he loved to share with friends and he had a keen interest in photography. He was an avid sportsman as well as a sports fan. He was also a good athlete, excelling in every sport he tried despite his small stature. He always got a kick out of telling the story about his fascination with the game of football (North American style) that he first saw when he studied at Ryerson. Attending every home game Ryerson played, he decided to give the game a try despite his lack of knowledge about even the fundamentals of the sport. He had never touched a football before he went to Toronto but, amazingly, after a couple of tryouts, Alain was accepted to play with the Ryerson football team. 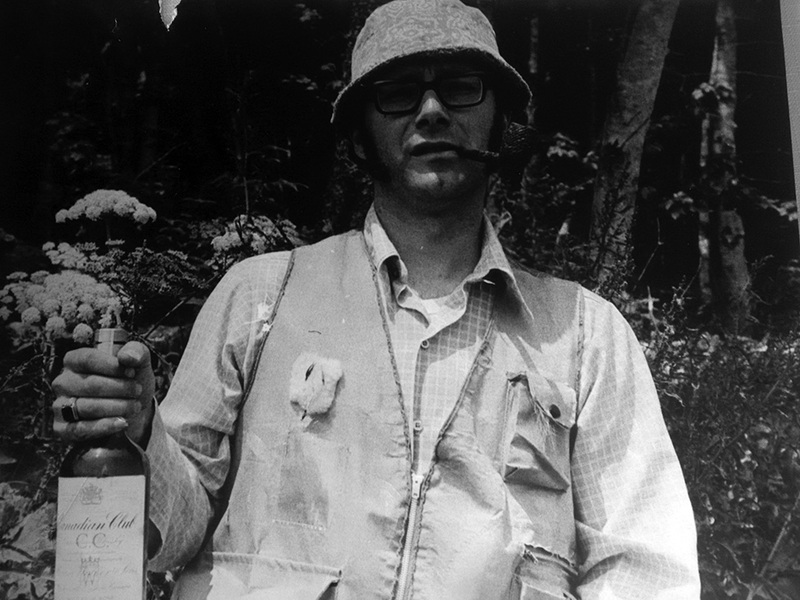 Alain on one of his famous fishing/hunting trips. “Here I was, 5’7” and 125 pounds, soaking wet, staring at these great big guys coming at me — they sounded like a heard of cattle running down a hill —but I’d cut them big buggars off at the ankles and run like the devil,” he laughed. Golf later became his passion and even the more accomplished golfers admired his ability to compete with the best of them. He also loved baseball and was an excellent pitcher and hitter. And in winter, he was always up for a game of hockey. But perhaps more than anything, Alain was known for his sense of humour. 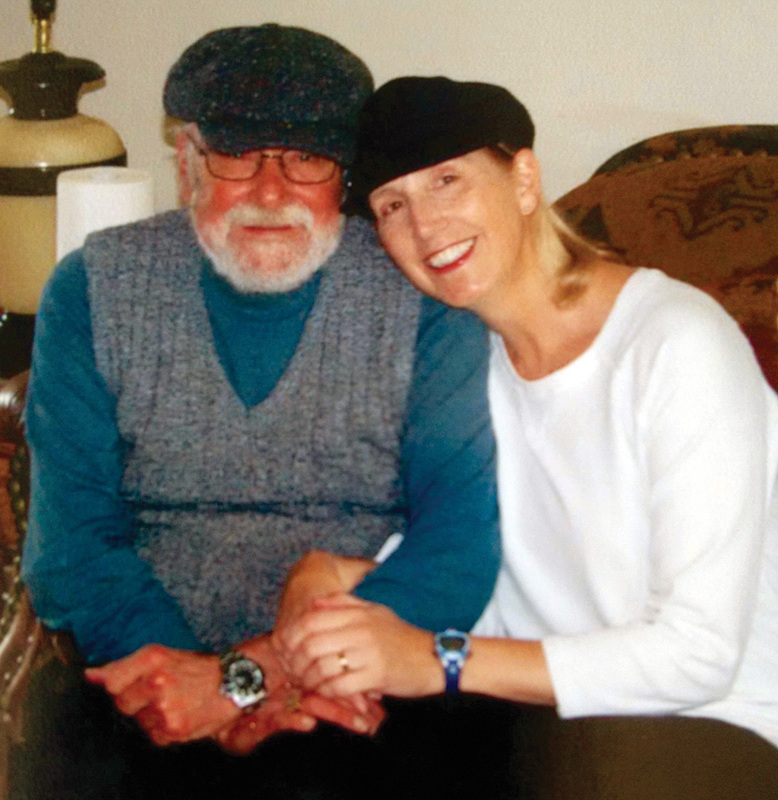 Tina Comeau, editor of the Tri-County Vanguard newspaper and a longtime colleague of Alain, paid tribute to her friend and former mentor. Commenting on his wit and humour, she said it would be best not be alongside Alain during an event where laughing would be inappropriate — funerals and church services comes to mind. Tina has stories to illustrate her claim. “He saw humour in just about everything and couldn’t resist launching another of his renowned witticisms to sum up the event. It’s just the way he was,” she wrote. Alain’s daughter Barb Muise agrees. Barb says Alain was a wonderful dad, although he wasn’t her biological father. “Alain married my mom when I was in Grade six and he adopted me, along with my two siblings. To me, he is the only father I ever had.” she says, adding that it took a special kind of man to take on that kind of responsibility. Barb speaks glowingly of Alain and talks about how he often used his wit and humour to embed meaningful parental guidance in ways that would never be forgotten. One of her favourites is a story about when she did a school creative project. Barb sat up a card table in the living room as her desk and worked on the project for two or three weeks with all kinds of papers and things strewn everywhere. When she announced to Alain that she had finally finished her creation, Alain said; “good, maybe now you can clean up that mess.” Barb listened and put things in their appropriate places. Her somewhat surprised dad suggested she should get an award for that. So, he did something about it. Barb regales passionately with story after story about her dad. “I’m very proud of him,” she smiles. Barb’s husband, Paul Smith, says Alain had a deep knowledge of Yarmouth regional history. For most readers of The Navigator, Alain was an intrepid reporter of fishing news from southwest Nova Scotia. 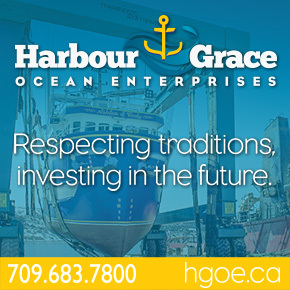 One of the people he came to know well was Denny Morrow, former executive director of the Nova Scotia Fish Packers Association. Denny describes Alain as a dedicated journalist. “He was dedicated to the inshore fishery and he covered that really well and he covered it with humour and with wit,” Denny says, adding that he admired how Alain never forgot his roots and always maintained contact with his friends from back home. Denny says that despite Alain’s humour and wit, he was a bit of an introvert, depending on who was in the crowd. Alain and son Kevin on a fishing trip. “I’d invite him to gatherings and he’d rarely come and when he did, he’d find one or two people to talk too for a little while and then would soon discreetly disappear, however, if he was at a fishermen’s meeting, he would be right at home,” Denny says. Denny says Alain had an innate bias toward the inshore fleet in his early reporting. “I think it was a matter of him growing up in a small community where inshore, small boat, fishing was what they had. They considered the larger vessel fleet, especially draggers, as sort-of villains so obviously Alain felt the same way. So, they (larger boat captains and owners) never thought of the Sou’wester as a friend back then,” adding that Alain didn’t say anything negative about the fleet as much as he barely acknowledged them at all. But as executive director of the Fish Packers Association, Denny represented many of those “villains” and asked Alain to come with him and tour several plants and meet the people involved. “And, to his credit, he did and he soon started covering that sector and he did so fairly,” Denny says, adding that the coverage was appreciated and respected. Alain has long been considered a very knowledgeable journalist. He covered the fishing industry with integrity and honesty, often spicing his writing with a spattering of his famous wit and somewhat quirky verbal imagery. Allen Louie Muise (Alain Meuse) passed away on August 5, 2017. He was 75. No Replies to "Two Names But One of a Kind"